The Functional Medicine Model (FMM) is a methodology of health care which attempts to restore balance in essential body systems rather than managing symptoms of ill-health. Assimilation: the digestion and absorption of nutrients. The bodily systems identified in the FFM are interconnected; nothing works in isolation rather as one functioning whole. If there is an area of dysfunction it can have a knock on effect to different areas. An example of the difference between the FMM and the traditional medicine approach would be to look at a condition such as eczema. A person would present to the doctors a collection of symptoms such as red itching skin. It is the doctor’s job to then make diagnoses of that condition which is something nutritional therapists cannot do. The doctor would then try to marry up a suitable treatment for that condition such as a steroid cream, or refer them to a dermatologist that specialises specifically in skin complaints. A functional practitioner would work in a slightly different way, by taking a detailed personal history to answer the question what happened in the body to cause the eczema in the first place. During the initial consultation many questions will be asked about your families’ health history and your early life, including anything known about your birth. In the FFM these are known as antecedents which may have relevance to your current health and/or used in view of preventative health care strategies. The FMM also looks at triggers and mediators. Triggering events are often significantly emotional/traumatic periods in life which may have been a catalyst for creating a health imbalance. Mediators cover aspects of your diet or lifestyle that could be perpetuating the health problem and preventing recovery and repair to take place. All of the information gathered from the consultation and your questionnaire is then mapped out onto a Functional Matrix. The picture below gives an example of the different areas that the information is mapped onto. 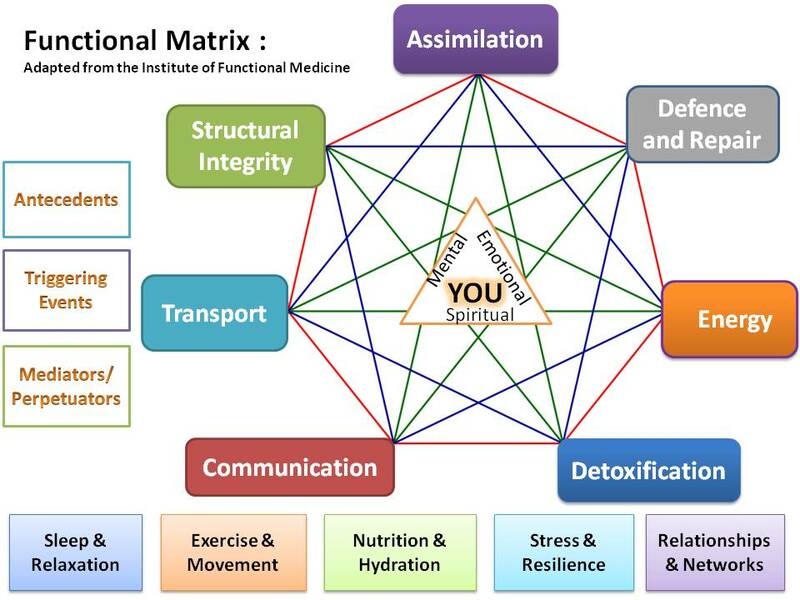 The functional matrix helps the practitioner connect your symptoms to the different systems in the body. Connections are then made across the systems to understand how the symptoms may affect the different areas and what the impact of that is. Once the connections are understood, the practitioner can further evaluate your case using the evidence base for nutritional science.